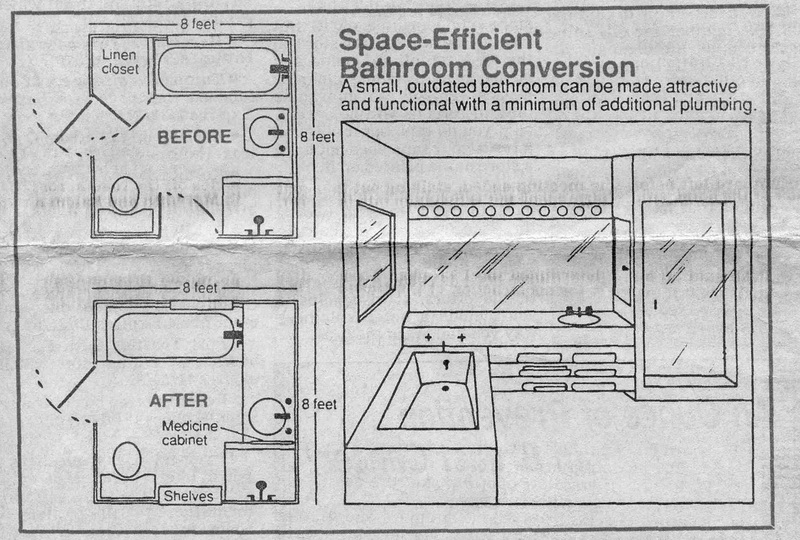 Q: Enclosed is a sketch of our existing bathroom. 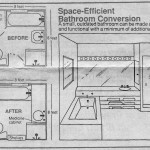 We would like to do some remodÂ­eling of our existing bathroom (a sketch is enclosed), but don't want to get involved with moving a lot of plumbing because we're trying to keep the cost down. HowevÂ­er, there is an unfinished basement below where the plumbing is accessible for minor changes. Can you help with any suggestions? SomeÂ­thing really must be done. A: From your sketch I can understand why you find your existing bathroom unworkÂ­able. It must be virtually impossible to put on makeup or shave because there's no place to put anything down. Realizing that you want to change as little plumbing as possible, many dramatically difÂ­ferent options are not feasible. However, after analyzing your floor plan, there is one idea that I think would not only work well, but also be very attractive. The main objective is to create a sink and counter top area, hopefully relieving some of that cramped feeling. Remove the linen closet and move the tub two feet to occupy that space. The existing plumbing can be utilized. It would be a matter of extending the drain pipe and water feeds, which should not be at all a major job. In fact, it involves very little from a plumbing standÂ­point. Everything else in the room would remain where it is. This will now give you two extra feet at the head of the tub. Remove the existing sink and build a counter with a drop-in sink that exÂ­tends from the shower wall to the window wall. You'll now have 60 inches of usable space instead of a 24-inch wall-hung sink. I would build the counter top and the face of the counter (which also houses the new faucet and handles) with the tile you've selected for the rest of the bathroom. I would also use it around the tub area. This will give you a uniÂ­fied, more expansive appearance, by making one area flow into another. Regardless of the overall counter height you select, this will leave space underneath for shelves that can hold towels and other things that were previously kept in the linen closet. The pipes from the sink will be hidden by the 12-inch tile facing. I would not suggest closing in the entire lower portion of the sink area as it would be too massive and heavy. If you feel you need extra storage for things you prefer not to be visible, consider installÂ­ing a medicine cabinet next to the sink in the shower wall. Choosing that wall for the mediÂ­cine cabinet will leave space for a solid mirÂ­ror installed above the entire length of the sink-counter top, thus creating a feeling of exÂ­panded space and offsetting the cramped feelÂ­ing. A strip of makeup lights in a soffit above the mirror would provide good lighting. Recessed lights may tend to enclose the space more than the strip of lights would. The end of the counter area, close to the window and above the tub, would be an excellent place for some decorative plants, adding softness and color. The counter top would be approximately 24 inches wide, 60 inches long and 12 inches deep. You suggested the possibility of blocking off the unused door next to the shower. I do think you could gain a lot by doing that. I would sheet rock the outside wall but leave the recess. You could mirror the back of the 30-inch opening and install glass shelves which could be used for display and toiletries. The mirror would also reflect the light from the window, thus brightening that side of the room. The shelves could probably extend into the room a few inches to increase their overall depth without interfering with the shower. The edges of the protruding glass could be rounded, angled and polished. It would be very decorative and functional â€” a vast imÂ­provement over an unused door. In a small area, every effort should be made to redesign any unused space. The primary solution to your problem bathÂ­room is a rather unusual layout, but one that I feel works aesthetically as well as practically. I would be interested in hearing your reacÂ­tion, and I do hope some of these suggestions have been of help to you.